Let’s get one thing straight: computers are incredible. Each successive year that passes, I find my eyes blown away at the amazing capabilities of computers to create the kind of imagery found in movies like this. From hair and water effects to some of the more supernatural aspects, the visuals of this film are quite commendable. Sure, Zootopia (2016) looked good too, but since its characters weren’t human or in a “human” environment, it was difficult to see just how amazing the visuals could be. But this was likely due to Zootopia having more focus on an interesting plot instead of stunning effects. I am impressed that Disney has taken the leap to another non-white “princess” with Moana, but much of the cliche trappings of this type of film are out in full force. If I were to tell you Disney made a coming-of-age movie featuring the main character with an animal sidekick, a mute anthropomorphized assistant, and a magical, shape-shifting partner, you’d likely think I had just described Alladin (1992). Alternatively, if I informed you that Disney made a film set in the Pacific Ocean, you’d tell me it was Lilo & Stitch (2002). Consequently, Moana holds faithfully to the Disney formula, despite not having a romantic side-plot (a la Mulan (1998)). Maybe these are just side effects of having non-white characters, but this also helped give it a unique cultural backdrop which was propelled along by its catchy and singable songs. If anything, perhaps it is due to our society embracing the role of independent female leaders. Sure, the main character had the help of a demi-god, but she ended up doing most of the “heavy lifting” of carrying the plot herself. She didn’t need a man to accomplish her mission or achieve her dreams. 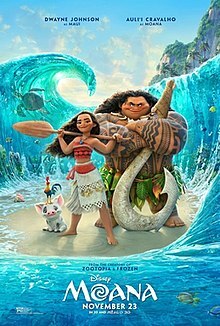 Another visually stunning Disney film with your standard Disney plot, I give Moana 4.0 stars out of 5.